There are tons of ways out there to strip minitures (both metal and plastci) and tons of products that will do the job. This is what I use to strip any minis I have. It will work on plastic as well but it really excells at metal. I've used it on models that were painted years ago and it had all the paint off in no time at all. Spray this stuff on, let it sit for about 20 minutes and then scrub with an old toothbrush. Repeat if necessary. It has no horrible odor, quite the contrary actually so it can be used indoors without worries. It can be picked up at Walmart for less than $3 a bottle. The only downside is that it will dry out your hands if you work with it long enough. Since it's a gel, it can be used to strip certain portions of a model as well and leave other area untouched which is a great feature if you find yourself needing to do it. Does anyone know if you can get this in the UK? Is it available under another name? Paul: I don't know if this can be bought across the pond. I would think so since Dawn is a fairly large company. Akozz: This stuff works on plastic but it depends on the type of paint used and how long the model has been painted. It will get most all of the paint off but you may have to scrub a littler harder than you would with metal. It didn't "melt" any of the plastic I used it on either. Paul the closest UK equivalent is probably Fairy Power Spray which works equally well. Thanks for the tip Ron, its always good to see how people go about doing things like this. Something that also works incredibly well for paint removal is Part B of Smooth Cast 300 by Smooth On (a two part liquid resin). I discorvered this by accident when I had left an old model on a table where I was working. Soaking the mini in the liquid requires about a full day for the best effect, but the paint will literally peel off the model with very little coaxing, and almost no effort. Simple Green is my favorite. Its another cleaning product that is relatively non-toxic & can be used in the house. any product mlade to clean the ground including Pine oil is working very well. One important note : it s not because something smell good that it won t harm you ! I ve read something specific about various domestic products that smell lemon and are pretty toxic : Most of those products are made to be used in small quantities, on the ground, not in large ones right under your nose. And I beg your pardon for my poor english. Ron: Thanks, it was something I forgot to do when I changed templates. Should be working now. While I do not have paint that needs stripping I do have a collection of lead minis that were laquered or varnished with some type of spray. I will give this a try since even if it does not work I can still use it for something(washing dishes) and should be healthier to work with than paint thinner(since people wash dishes with it). Grégory Privat: You make a good point, it's definitely worth reading all the instructions/warnings BEFORE using anything like this either inside the house or directly on your skin. That and a little common sense will go a long way. I'll have to give this a go sometime. I've always just used brake fluid from the auto parts store. It works, but can't be the best for you. I've got to echo Chicago Terrain factory. I love Simple Green concentrate. It's cheap, non-toxic, and works well. I give my metals a few days of soaking in this stuff, and the paint usually falls off. Enamel paint takes a little longer for it to really come off good. caked on acrylic comes off like a charm. When I pull the models out, the paint looks like a baggy suit on the models. I scrub with a toothbrush, and rinse with water. viola! new praetorian, Tallarn, and Steel Legion models! Huh, I will have to try this stuff out. My paint remover of choice is Castrol Super Clean. You can buy it in good quantities for cheap. I purchased a 2 gallon container over 5 years ago and I am still not quite done with it. CSC is meant to be a asphalt degreaser and general heavy duty cleaner. It is completely odorless so no worries there but I would suggest using rubber gloves as it will pull the oils from you hands on contact. I would suggest cutting it 50/50 with water but you do not have too. Also this stuff does not lose potency use to use but eventually the liquid will get pretty dark with dissolved paint and residues, so that is when I change it out. Just soak for 12 or so hours then scrub the paint off with an old tooth brush. Re dip if needed. Safe for both Plastic and Metal models, and GS and Resin too. I found a link to the company in the UK. it looks like it might still be called Simple Green over there. Thanks for all the input on this guys. This will go in the Tutorials Archive (one of my small contributions) and people will be able to get all this info as well. Anyone else use something different to strip their minis? Simple Green and Krud Kutter are safe on plastics. Castrol Super CLean is murder on your skin. Pine Sol and similar floor solvents will melt plastics, so avoid using them. In addition to Simple Green, I also use a Dremel brush bit to scrub the old paint off. You have to be gentle on plastics, but for metal it strips right off. Polishes it too! SO any Ozzies have any solutions they can recommend? rumour has it that you can use "Pledge One Go". It is essentially the same as "Future", once done you wash the model off with Windex and away you go. I plan to test these out myself. Also many general purpose degreasers will work ala "CSG". I will try some industrial degreaser we use around the workshop that is bought in 20L drums and let you know. Just an update for all Aussies in need of Simple Green. Apparently you can order from the Simple Green Website (www.simplegreen.com) or Contact their distributor in South Australia to get some delivered. Da_Sub and everyone else who is reading, DO NOT uses Future for any sort of paint removal. The links you posted weren't talking about Future for paint removal but being used to mask decals (as a clear coat really). The windex blurb was only meant for you to remove the Future floor shine if you mis-applied it. Re-read the articles if you don't believe me. The first one actually did have a little bit about the removal, I meant to say that the second link you posted didn't. I still would err on the side of caution since Da_Sub has provided the Simple Green info for aussies. Why go with an fairly untested method vs. a pretty widely lauded one that is proven to work? @enderwigginx, never got around to trying Pledge One Go yet (it does not seem to be in the local stores atm) although you are right that only the first link was about stripping using it. I am not sure but considering that you can use Windex to lift acrylics off ceramic tiles I am wondering if maybe the author of the link has confused the connection... although it is said in a few places you can use it to strip minis. I am trying a couple of things I got off a mate who is a professional cleaner (including pure windex when i get some more on the weekend). Will keep you posted. also Bucho is right about liquids in the post, your best bet is to get a whole carton couriered and sell the extras at a local gaming club (same goes for dulcoate and casting resin). For all the Aussies out there I have an updated list of stripping products. First BAM Easy off Degreaser and Cleaner (Green writing and Label Trim) also in same places called BAM Universal Degreaser; not quite as good as Dawn Power Dissolver but will work if you soak the figs overnight, it will not eat the superglue. Downside is that it is not a gel. Amway LOC Multi-purpose Cleaner (green label); this will work with an overnight soak, and is skin safe. Also you can use it straight as it is Gel rather than liquid. You can only use it once however. Also as reported by The Man Cave, you can get Simple Green in Bunnings Warehouse. Its is cheaper per volume than both but not as skin friendly. Tried Simple Green on my plastic mini's and it gets pretty much anything except unthinned Vallejo Model Colors and my GW Chaos Black spray primer off. But the Vallejo just isn't cooperating. 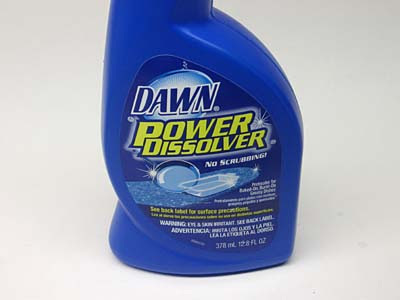 Is this Dawn Dissolver still around? Also, I've seen other folks recommend brake fluid. I know it's very corrosive, even on automobile paint. Will it hurt plastic mini's? Matt: There are a handful of tutorials on this very thing in the Tutorial secton under Painting. Lots of people have tried tons of different things and have been kind enough to post their results. Yeah, I checked out a bunch of those, but many seemed UK product specific, or they all claimed Simple Green could remove anything, but it's just not working for me, so I thought I might try some other options. Just 1 last quick note. I found some Power Dissolver, and it's working insanely well. Thanks yet again! Matt: Glad to hear it's working well. 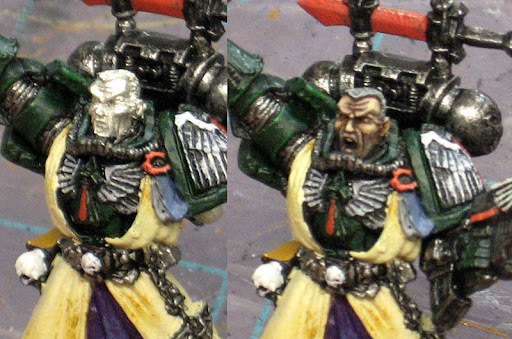 It may have trouble with some older paints/primers, but I've found two applications (when needed) generally cleans everything off without trouble. For those in the UK, Fairy Power Spray. I'd wager it is the same product as it does the same job! Im contemplating stripping my Ultramarine Terminator Captain (Metal Figure, old, 1 layer of paint did it long time ago) and repainting it to become a Black Templar Terminator Captain but i am unsure what to try after reading all of your ideas. I am Australian and i saw that Da_Sub had some good ideas but i was wondering if any of you have any final suggestions. 123456: Being in Australia might prove difficult to get a hold of certain products. I use the stuff pictured exclusively when I strip miniatures. But then again, I can get it easily. You can get Simple Green from Bunnings. I bought the stuff in the green spray bottle -> they have other types of cleaners too. I put some old metal minis into a tub with SG, and after some 4 hours, nothing happened with the toothbrush. Left it over night and the old paint comes away with a bit of a scrub. Thanks for the post and the Archive, Ron. Marshal: Thanks for the tip for you guys down under. I've just had a friend overspray his primer - he was using Army Painter black primer and spraying in his garage at night, at close range, and managed to fill up all the beautiful detail on his brand new dark vengeance dark angels. He tried both simple green (available from bunnings in Aus), and something else we've seen talked about on the net, Dettol (an antiseptic). He found the simple green struggled to remove the primer, but the Dettol worked very well, a small amount of scrubbing required with a toothbrush (as seems to be the norm for most of these products. It did ever so slightly melt a little detail off a couple of the models, but nothing massive, and certainly a big improvement from what they were. Maelwynn: Sorry to hear about the overspray problem, but glad to hear you guys were able to recover the models for the most part.